Powered by a 240 volt electric motor the hatch opens and closes smoothly. 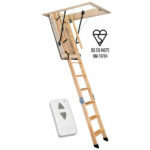 When fully open the ladder can be easily unfolded for easy access to your loft space. 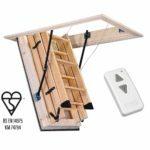 Hand made by Stira in Ireland, the ladder is made from North American yellow pine, the frame is made from European white deal. The result is an incredibly robust product which is backed up by a 10 year guarantee. 2.438m / 8ft 560, 610, 660, 711 or 762 x 1048mm 343mm / 13.5" 98mm / 3.86"
2.590m / 8ft 6" 560, 610, 660, 711 or 762 x 1175mm 343mm / 13.5" 98mm / 3.86"
2.743m / 9ft 560, 610, 660, 711 or 762 x 1175mm 343mm / 13.5" 98mm / 3.86"
2.895m / 9ft 6" 560, 610, 660, 711 or 762 x 1251mm 343mm / 13.5" 98mm / 3.86"
3.048m / 10ft 560, 610, 660, 711 or 762 x 1327mm 343mm / 13.5" 98mm / 3.86"
3.200m / 10ft 6" 560, 610, 660, 711 or 762 x 1835mm 343mm / 13.5" 98mm / 3.86"
3.353m / 11ft 560, 610, 660, 711 or 762 x 2038mm 343mm / 13.5" 98mm / 3.86"
3.505m / 11ft 6" 560, 610, 660, 711 or 762 x 2089mm 343mm / 13.5" 98mm / 3.86"
3.657m / 12ft 560, 610, 660, 711 or 762 x 2140mm 343mm / 13.5" 98mm / 3.86"
3.810m / 12ft 6" 560, 610, 660, 711 or 762 x 2140mm 343mm / 13.5" 98mm / 3.86"
3.962m / 13ft 560, 610, 660, 711 or 762 x 2140mm 343mm / 13.5" 98mm / 3.86"